Seductive Sky by Carrie Martin is the latest release on the Psychotron Records label. One of the great things about having a record label and a shop in the high street is the chance to put on an event. 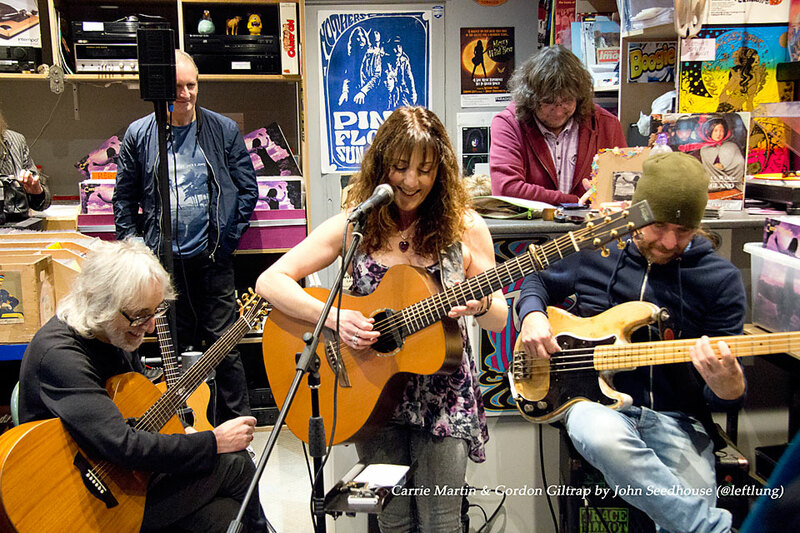 What better way to launch a wonderful collection of songs than to invite lots of regulars to pack out the shop on a Friday evening and then enjoy a live concert. Take one clear floor-space, add a multitude of guitars, a bass player, a special-guest guitarist and the purple-doc martin wearing Carrie Martin and you have what is only ever going to be, a special night! We first came across Carrie Martin through our good friend Gordon Giltrap. We were smitten with her wonderful talent as a singer-songwriter from first listen and were really excited to release Seductive Sky on vinyl. It seemed a total no-brainer to have her perform songs from the album in the Psychotron Records shop. It was everything we could have hoped for. 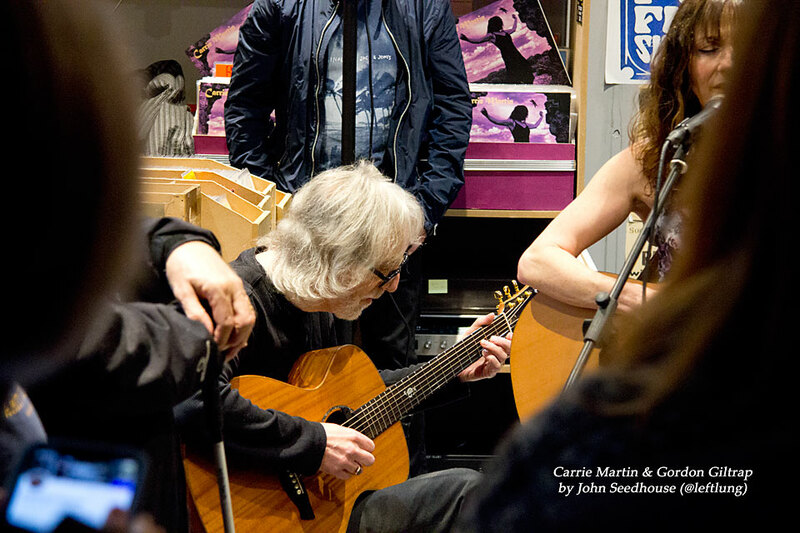 Carrie Martin’s new album, Seductive Sky is her third and the moment Pete heard it he thought that it needed a vinyl release. The album features contributions from Gordon Giltrap and Oliver Wakeman. We managed to fit Carrie, her equipment, bassist Jamie Fowler and Gordon Giltrap into our improvised “performance area”. If anyone needed reminding why we were all crammed into the shop on this damp evening then Pete and Carrie had strategically placed copies of the record onto all the shelf and rack spaces. 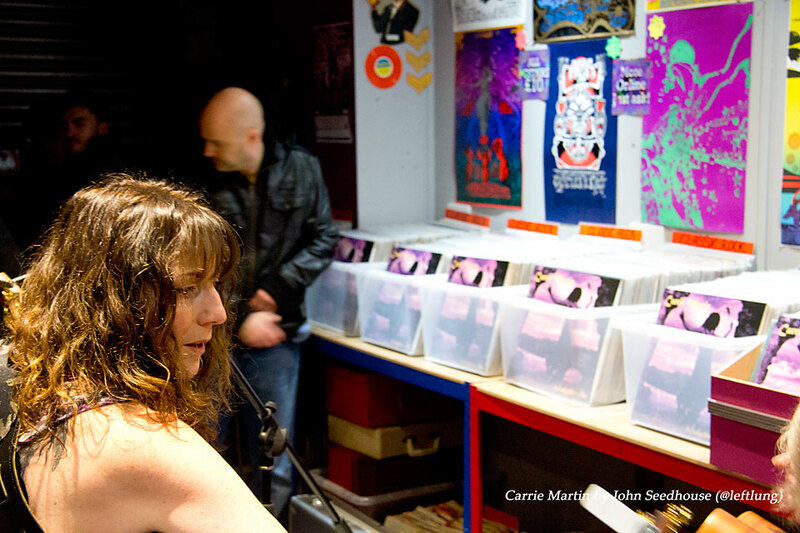 Purple must be one of Carrie’s favourite colours and we pressed the record in special purple vinyl. This was matched by Carrie’s rather lovely purple Doc Marten boots – a theme which continued with the opening song of the night – Purple Heart which is the last track on side 1 of the record and also the pendant she was wearing round her neck. Pete has always wanted to have live music in the shop and the sight of a packed audience, rapt in attention to the second track of the night, You Make Life Look Easy suddenly made us realise just why record shops and music are so important in life. Carrie introduced the next song, Paper Thin telling us about some of the walks she has taken on the beach with Gordon’s wife, Hilary and how inspired she is has been by the many discoveries Hilary has made of artifacts and antiquities on these walks and the the craftsmanship in turning objects into art. Dan Cassidy, the brother of Eva plays fiddle on the the album track Dancing Dragonfly and this came next. Dan had heard Carrie on the radio and contacted her about playing with her. Maria in the Moon was next. 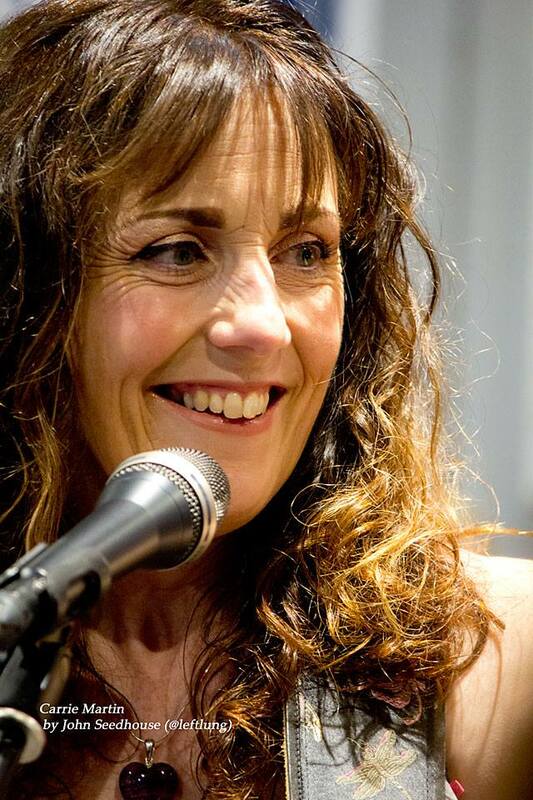 The song is based around the book of the same name by Louise Beech. Perhaps one day this will be the title track of a dramatisation of that book? Carrie stepped aside for a short break and we were treated to a fabulous performance of Heartsong by Gordon Giltrap. This was the track that has dominated Gordon’s career as it was chosen by the BBC to be the theme music to a long running holiday program from 1978 – 85. 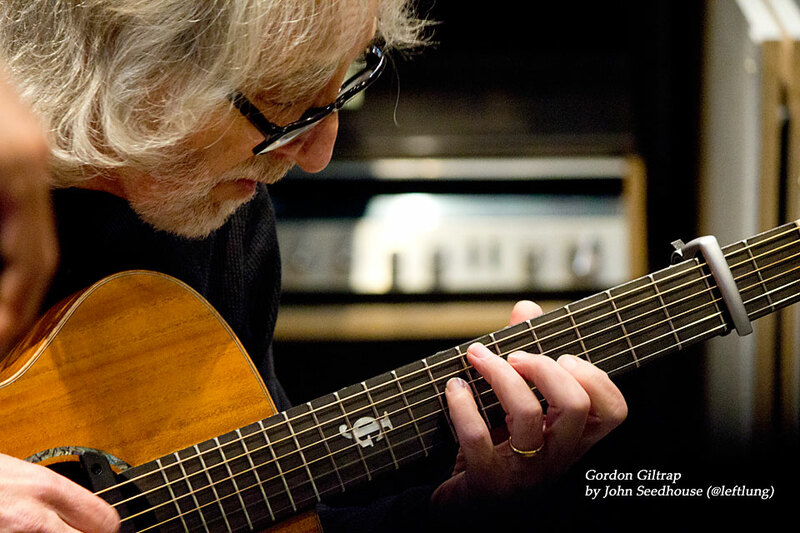 You could see the audience wide-eyed at the speed and complexity of of Gordon’s hands across the guitar. Carrie returned to the mic with Time and this was followed by High on a Hill which is the other track that we sadly had to drop from the vinyl version of the album. It is horrible when you have to play editor with such wonderful music because of the constraints and it is never an easy decision to make. Heartbeat came next with Gordon adding his own flourishes (after some discussion about keys) and then the second nature inspired track, Holly Blue. Just add a little bit of nostalgia, Carrie told a story about a song that she played when first returning to music after an almost 20 year hiatus. She promised the audience a trip down memory lane form her and Gordon’s live repetoire. There was much giggling when Gordon drew a total blank on what track was actually coming up… It was a rather storming version of the Cyndi Lauper classic, Time After Time. The final song in what had been an outstanding set was the emotionally charged Woman in Me. Carrie introduced it with the story of a neighbour in Hull who cared for a field of neglected horses. This woman inspired her due to her commitment to selflessly caring for these horses even through a terminal diagnosis of cancer. The song seizes on the power of positivity that this lady showed and the effect of “doing something” rather than lying down and accepting fate. It was an emotional ending to a wonderful evening. We have some exclusive live video of a couple of the tracks on our Facebook Page. Head over there and give us a like and watch how we can put on a shop/show! The shop was full of friends, customers and music fans. Floyd and Jane having travelled the furthest – all the way from Barnsley. It was a lovely evening and the album has received some great reviews from customers. 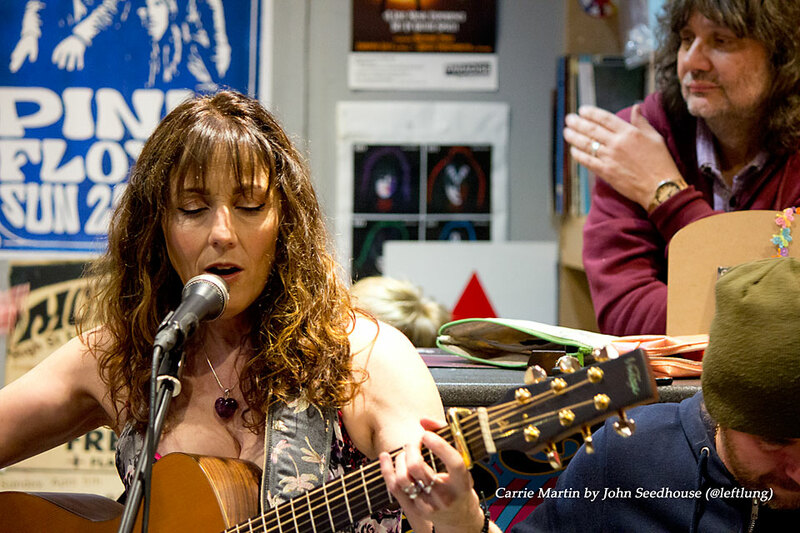 You can buy our vinyl release of Seductive Sky by Carrie Martin by either coming to visit us in the shop or here in our online shop. It would make a great early Christmas present…. Indulge yourself in the beautiful voice and intricate guitar playingof this extremely talented singer/ songwriter and gifted guitarist… this is definitely a must have for vinylcollectors and true lovers of music.